I visited my local branch of Ikea recently and as is my want, I decide on a breakfast before perusing the flat-pack emporium. As you might expect the queues on a Friday morning for a family brunch at £1.25 were excessive and so I had plenty of time to stand and watch the servery staff in operation. What appalled me, was seeing a staff member pawing lasciviously, with uncovered hands, the plates prior to piling with egg bacon and sausage. I know its a cheap meal but I don't want a plate of fingerprints to accompany my extra portion of mushrooms! Needless to say, a complaint to the restaurant manager soon followed. 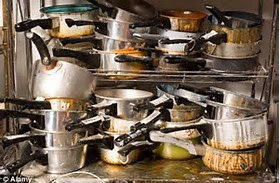 Have you ever complained about the hygiene levels in you local restaurant? The Food Standards Agency has just published figures to show that complaints about dirty restaurants and food fraud rose by almost 25% in a year, with one in twenty eateries putting its customers at risk. There were 85,000 complaints made in the year up to March 2017, up 23.5% on 2016. There was also a rise of 32% in the number of hygiene complaints that the Standards Agency investigated - a total of 73,800. So what's caused this sensational rise? Why are there now more complaints from restaurant customers? Well, it seems that policing by local councils of hygiene levels and food fraud, like passing horse meat as beef and authenticity, such as restaurants selling cheap food as premium quality has been scaled back The number of these complaints investigated in the year was down by 12% to 11,400. 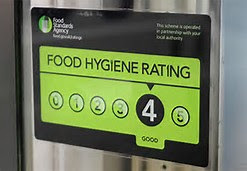 The figures from councils show that 6% of the 635,000 eating establishments they police were unsatisfactory, but they were unable to serve and support food hygiene improvement notices. Apparently, it's all down to cuts in staffing levels within local councils. They just don't have enough food hygiene officers any longer to visit eateries, take-ways, cafes and fast food outlets on their patch. As a result, we, the customer, are complaining much more and the incidents of food poisoning are increasing daily.